The fjord trout head is rounder while the salmon head is sharper. Also the fjord trout flesh appears in deep red-orange hue compared to that of salmon which is a paler shade of orange. The fjord trout grows to a weight of 2-5 kilos – generally a bit smaller than salmon. 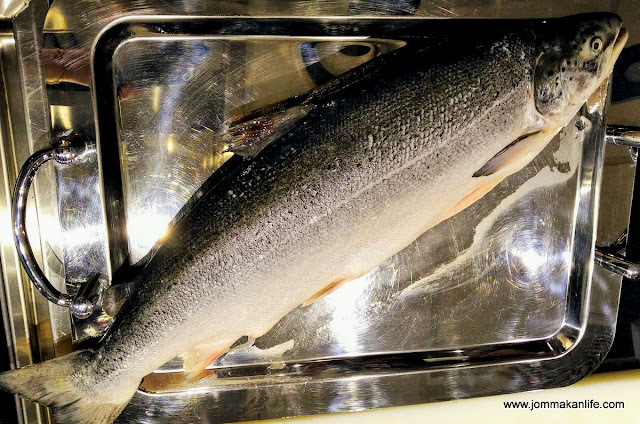 Although the skin of the fjord trout is similar to salmon, it has a lustrous, silvery colour. Fjord trout meat with white marbling has a healthy sheen and is firm, yet tender and mellow. Taste-wise, the fjord trout boasts a richer flavour with a pristine aftertaste of the sea. Jon Erik Stenslid, Director, Southeast Asia, Norwegian Seafood Council also shared a video presentation on the farming of Norwegian Fjord Trout in the cold, clear waters of Norway’s fjords that stretched along its coastline. “Norway is the second largest seafood exporter in the world, and the world’s largest producer of farmed Atlantic salmon and fjord trout. Harvesting from the seas has always been an important part of Norwegian culture and history. In fact, fishing was a vital premise for Norwegian pioneers to settle down and live along the cold, windy coastline,” said Stenslid. Her Excellency Gunn Jorid Roset, the Norwegian Ambassador to Malaysia, also graced the workshop and sportingly donned an apron to join in the hands-on cooking workshop. Before our cooking stint, Chef Jimmy Chok shared various ways to cook fjord trout and salmon, highlighting how sweet, sour and spicy Asian flavours like asam pedas, masak lemak or steaming with soya sauce work well with the fish. He then demonstrated how to fry the trout, over medium heat, and served it with mango salsa. We were also treated to delicious samplings of the fjord trout and salmon, served sashimi-style, as well as smoked. It was a revelation for us as the difference in taste and texture was noticeable on the palate. 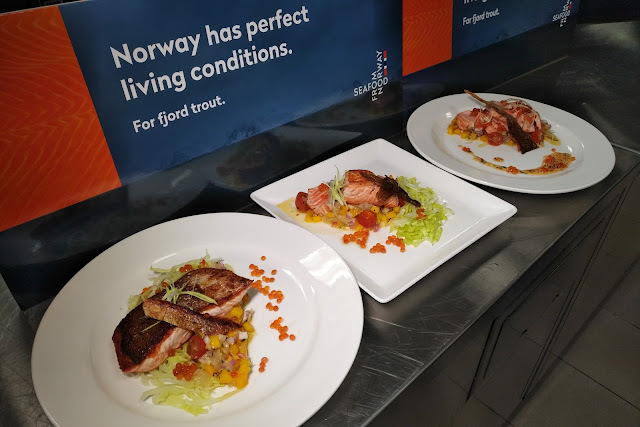 The Ambassador - a keen cook herself - partnered with Jon Erik Steenslid to cook up a colourful, hearty fjord trout dish. Chasingfooddreams and myself combined our efforts to replicate the same dish Chef Jimmy had demonstrated earlier. 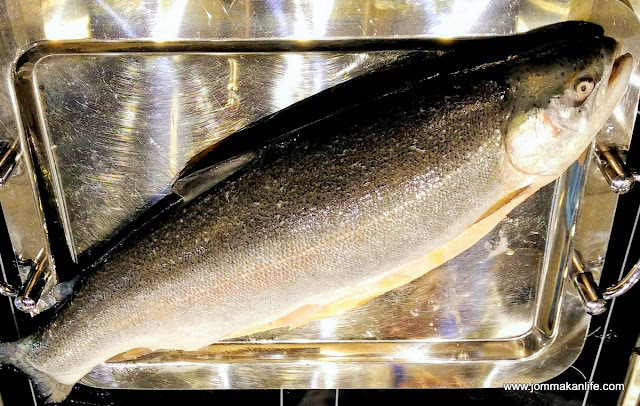 We thoroughly enjoyed the entire experience and went home knowing so much more about the versatility of the Norwegian fjord trout the skill of cooking it properly. The Norwegian Seafood Council (NSC) is owned by the Ministry of Trade, Industry and Fisheries in Norway. Headquartered in Tromsø, NSC is present in major markets around the world, aiming to increase the value of Norwegian seafood resources. NSC also oversees the administration and use of the trademark “Seafood from Norway”, a joint value for the Norwegian seafood industry. Because consumers today are increasingly focused on the origin of food, how it is produced and how it meets concerns regarding sustainability, the “Seafood from Norway” trademark addresses such matters. The trademark is a symbol of origin and quality for all Norwegian seafood, farmed or wild caught in Norway’s cold, clear waters; leaving no doubt about the fact that Origin matters. Season trout with salt & pepper. Sear over medium heat until fish fillet is medium rare. Allow to rest. Mix mango salad ingredients together. Stir well and season to taste. Mix dressing items evenly and set aside. To plate, spoon a heap of mango salad onto plate. Remove skin from trout and use your hands to flake the trout. Place on top of mango salad. Fry trout skin until crisp. Cut into triangular shards and place on top of trout fillet. Garnish the plate with trout roe, cherry tomatoes (cut into halves) and micro herbs. Swirl dressing around the trout using a spoon then sprinkle sesame seeds around it to serve.